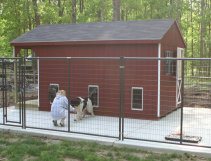 The best and easiest way to purchase your new shed! 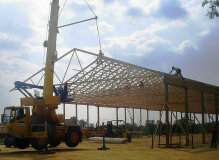 Let us assist you in customizing a building to fit your specific needs. 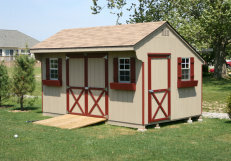 With six standard styles of storage sheds and garages, we have many options to meet the storage needs of our customers. The customer chooses the layout of the doors and windows, as well as the wall, trim, and roof colors. Additional doors, windows, cupolas, ramps, pads, vinyl siding, dimensional shingles, and many other options can be added. Most of the styles are available in sizes ranging from 6' x 8' through 14' x 36' at 2' intervals. These building are standard styles, but equipped with custom options. Door and window styles are according to customers request. The floor plan and layout are custom designs. Stall, dividers, and many other options are available. In addition to our standard options, we can also do custom work to meet your specific needs. These units are designed to be as maintenance free as possible and provide years of enjoyment. 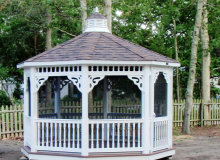 The gazebos, pavilions, and oval pavilions are constructed of pressure treated lumber overlaid with vinyl. There is no exposed wood on these units, eliminating the need for staining or painting. These vinyl units will provide years of no hassle use while always looking crisp and elegant. All units are available with or without screens. Prices for large buildings are determined on an individual bases. Options such as wall height, overhangs, roof pitch, and layout will all be custom designed for each building. Stamped engineering prints are available. The buildings are post framed with metal siding and roofing. The buildings are constructed of the finest materials available and designed to exceed the highest of standards.